And pretty happy about it. At 9 1/2 months, the boys are starting to get around. Rolling every which way, sliding backwards under the couches, jamming their legs through crib slats, pinning themselves perpendicular in their beds (until I can rescue them). But the good news is… they’re on the move. Heck, no! I said. Once they’re ambulatory I won’t have to bicep curl two babies at a time, or make two trips everywhere (first one, then the other). Independence is a good thing! I love sitting the boys up, scattering toys at their feet and watching them. They’re content when they have each other. Occasionally I hear giggling in the living room. Usually I find one has toppled over and rolled around to get close to his brother. They chomp on each other’s fingers, bump heads, press a heel into a tummy, or pat each other on the back. Sometimes there is scratching, hair-pulling and tears. But mostly they seem to enjoy razzing each other. Maybe it reminds them of the good ‘ol days. In utero. I’m pretty much in love with these little guys. Yep – It’s a love fest around here. If they were edible I would have munched them to pieces by now. Yesterday I noticed a big ‘ol zit on the side of my nose. (This happens when I nuzzle them too much.) To date, I’ve counted six. Acne on the forehead, chin, and nose. So loverly. But I can’t quell the kissing and nibbling. 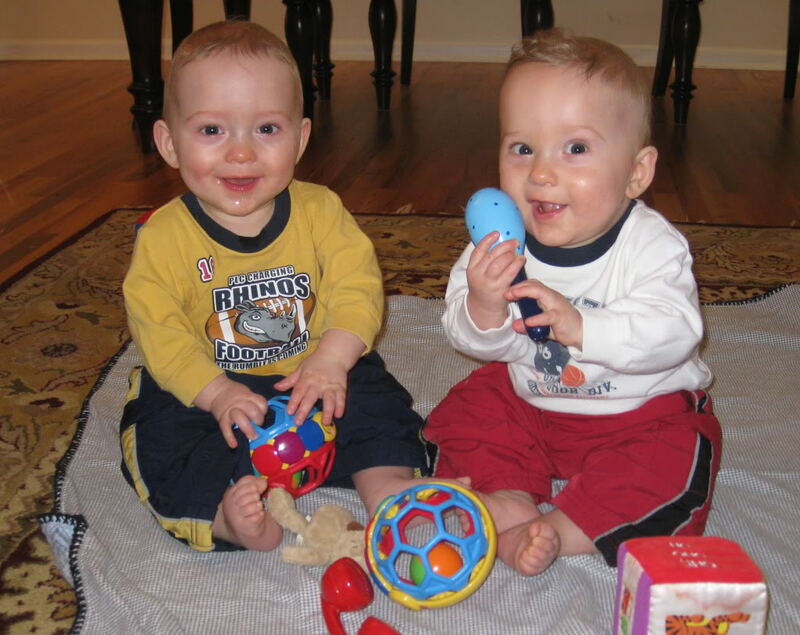 I love morning time – opening the door to find both boys on their tummies, looking through their cribs at each other “talking.” Wednesday morning when Spencer saw me, he took a long noisy breath in, then whooshed it out with a loud squeal. As soon as I picked him up he buried his head into my shoulder, grabbed my face with both warm hands and gave me the sweetest eskimo kiss. Then he tried to eat my nose – which just made me laugh harder. Maybe I’m reading too much into his love language. But he seemed so excited to see his Mama. And I soaked it up. Those darling bubbly faces. Reminds me of this song I’m loving lately. Give a listen. Bubbly by Colbie Caillat. We’ve been out for a few walks since the weather has been warmer. Sometimes I have to stop and tip my face to the sun. Drench my skin with light. The girls have been riding their new bikes. They are picking up speed. But a few days ago, what should have been a stroll turned into a roll…er coaster ride for the boys. A friend of mine, who was driving by, stopped to chat. I put the brake on our double stroller, then turned my attention to her. Seconds later she made a gasping sound and pointed frantically behind me. Turns out Sami decided to flip the brake up and watch ‘er roll. That’s Sam for you. Experimental. “Don’t touch that – it’s hot Sam.” She touches it. “Sami – don’t pick that up. It’s gross.” Picks it up. “Don’t go in the street Sami!” She jumps onto the asphalt. “Sam – don’t touch the toilet water.” She dips her finger in. Saints be praised. No harm done. Alright. I’m done gushing over my boys and their munificent cuteness. But before signing off, here’s a little clip of Gordon. This week he figured out how to mimic my kissing sounds. What a charmer. Listen carefully and you can hear Ali yell, “Mommy? I had a stinky in the toilet.” Keepin’ it real folks. Just keepin’ it real. The boys are darling. When tending the other night I also found myself kissing that delightful spot on their necks. What a wonderful gift you have for finding joy in the moment. Love to all of you. Leslie – thanks for loving the boys. (And the girls!) You and Mary were so wonderful with all of them! Honestly, I can't thank you enough!!! Cami – Yes…Toes! I dread the day when those little baby feet are no longer appetizing. I'm not one for big people feet. But babies… mmmmm…. Can't believe you're 30th celebration! Um- you are crazy! Happy Birthday!!! Those boys ARE cute!! I love the video. You're a good Mommy!! Thanks Deb with a capital D! Love you! Cristie – yes…. sweet. But turning into little boys way too fast! I can't believe how big they are getting. Do you think they could teach Kid B the kissing noises? So cute!